The Kansas City Royals made a concerted effort at the trade deadline to improve their pitching staff in hopes of sneaking into the playoffs. But it appears their top July acquisition has been lost to injury for the foreseeable future. 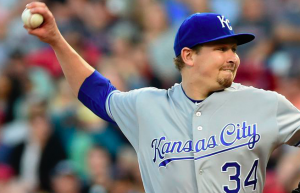 The Royals placed starter Trevor Cahill on the 10-day DL on Thursday. Cahill has been diagnosed with an impingement in his right shoulder. Reliever Kevin McCarthy has been recalled from the minors to take Cahill’s spot on the roster. The Royals acquired Cahill along with relievers Brandon Maurer and Ryan Buchter from the San Diego Padres a week before the trade deadline. Kansas City was hoping that Cahill would help fortify the back end of its starting rotation for the stretch run. Despite missing six weeks of action with a shoulder issue earlier this year, Cahill was putting together a strong season with the Padres. In 11 starts, he was 4-3 with a 3.69 ERA. However, that success has not carried over following the trade. In three starts with the Royals, Cahill has posted an ERA of 8.18. He’s totaled just 11 innings over those three starts, with opposing batters hitting .375 against him. During Wednesday’s start against the Cardinals, Cahill had serious control issues, walking five while allowing three runs in just 2.1 innings. As it turns out, Cahill’s recent struggles may be injury related. If his shoulder issues from earlier this year have resurfaced, it could explain why Cahill has been such a disappointment since coming to the Royals. There’s no timeline for Cahill’s return right now. But the Royals are hopeful that he’ll only miss one or two starts before returning to the rotation. The Royals desperately need Cahill to return to their rotation as soon as possible. However, they need the Cahill who was so effective for the Padres earlier this season to show up. Outside of Danny Duffy and Jason Vargas, the Royals have struggled to get consistent performances from their starting pitchers this year. Cahill was supposed to give them a third starter they could lean on down the stretch. Without reliable starting pitching, the Royals will have a difficult time reaching the top of a crowded wild-card race. Taking over first place from the Cleveland Indians would be even more difficult. Inconsistency from the starting rotation has played a role in the Royals losing eight of their last 10 games. At the start of action Thursday, Kansas City was four games behind Cleveland in the AL Central and one game out of the second wild-card spot. With Cahill on the DL, the Royals have few other options for the fifth spot in their rotation. Trading for another starter may not be ruled out. Of course, the options on the market are limited. The lone internal option may be rookie Jake Junis. However, in five starts he made for the Royals in July, Junis posted a 6.35 ERA. But if Cahill can’t return and be effective, the Royals may not have another option. At the moment, the Royals are hanging on in the playoff race. But with unreliable starting pitching, they are by no means favorites in the wild card race. The news that Cahill has another shoulder injury is a significant setback. If he can’t return from injury and return to the form he had earlier this year, it will be hard for the Royals to sneak into the postseason.